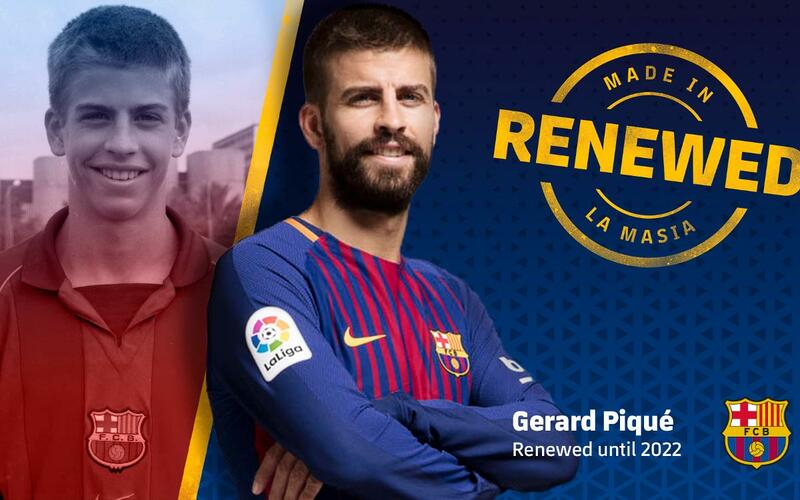 FC Barcelona and player Gerard Piqué have reached an agreement to renew the player's contract through to 30 June 2022. His buyout clause has been set at 500m euros. In the coming days the club will announce the date of the official signing of the new contract, which will keep the La Masia product at FC Barcelona for the rest of the current season and for the next 4 years. Gerard Piqué joined FC Barcelona in 1997, aged just 10 years old. The centre back started out in the club’s junior ranks, at the youngest level available at the time -Under-11s B- and steadily progressed through the different age groups. He left La Masia in 2004 to move to Manchester United, where he gained experience playing in the Premier League and also in LaLiga when he spent a season on loan at Zaragoza. In the summer of 2008 he was brought back to Pep Guardiola’s Barça side as a proven central defender. His return to the club was a hugely important move, as he has been a key part of the best moments in Barça history to date. The defender, considered one of the best in the world in his position, has won everything there is to be won at club level for the Blaugrana: 3 Champions Leagues, 6 LaLiga titles, 5 Copa del Reys, 5 Spanish Supercopas, 3 European Supercups and 3 Club World Cups. In total, a player who identifies with the club more than anyone has earned 25 trophies. Gerard Piqué has played 422 games for Barça and scored 37 goals. This season he has been one of the players most frequently used by Ernesto Valverde, with 25 appearances and 2 goals to his name.